You should not underestimate the importance of having a source of KI potassium iodide (chemically known as KI) as part of your survival kit. It is possibly the main thing that will keep you and your family alive in the event of a nuclear strike near your home unless you have full body suits with built in respirators. 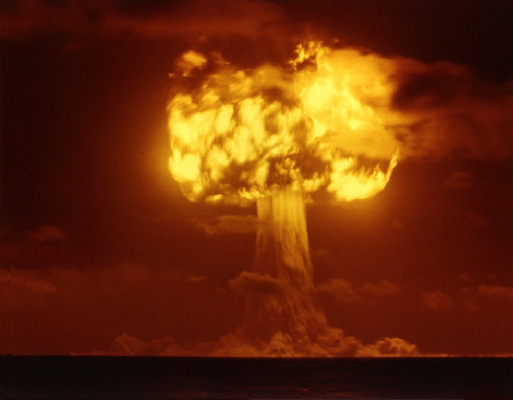 When a nuclear strike occurs, the air becomes filled with radioactive iodine. This is easily inhaled into your system and is what causes the symptoms of radiation poisoning. Because it becomes airborne, it can also settle into the water supplies and unprotected food sources meaning that there are multiple ways for it to enter your system. Radioactive iodine causes problems because it becomes absorbed by your thyroid which is responsible for creating and releasing hormones into your blood stream. KI Potassium iodide works by blocking the uptake of radioactive iodine into the thyroid. This then makes it easier for your body to dispose of it as waste without it harming your thyroid too much. Your thyroid doesn’t know the difference between regular healthy iodine and radioactive iodine, so by flooding your thyroid with KI potassium iodide, you effectively saturate it so it can’t take in any of the radioactive iodine. The common misconception is that taking potassium iodide will stop you from getting any form of radiation poisoning. This is not true. All that taking KI will do is protect your thyroid from absorbing radioactive material. It also can’t undo the effects of any radioactive iodine that has already been absorbed by the thyroid and won’t protect you against other forms of radiation such as gamma rays. Simply, if the nuclear strike hasn’t released radioactive iodine into the air, then taking KI is a waste of time. Hopefully, in the event of a scenario where radioactive iodine has been released into the air, government and medical officials will make press announcements giving advice and instructions about preventative measures. These may be things like not drinking or eating from certain sources and wearing respirators to reduce the amount of radioactive material you take in. Children – kids between three and 18 only need 65 mg of KI as their thyroids are smaller and less productive than that of an adult. Infants – children under the age of three need half that of older children (i.e. 32mg). This dosage is the same for both nursing infants and those able to eat solids. A single dose of KI will protect the person taking it for up to 24 hours regardless of their age. You will only need to take it for a few days until the air currents clean the atmosphere a little. The above dosages are those set out by the CDC, so it’s unsurprising that all KI tablets come in 130 mg doses. The market leader by a long shot is Iosat and they produce packs of 14 and 28 tablets at a time. Expect to pay around $12 for a pack and you should aim to buy enough to supply everyone in your party for at least four consecutive days. Fortunately, there’s a seven year guarantee on these so you can buy them now and tick them off your list. Finally, make sure that any KI potassium iodide products you buy have been FDA approved. There is a competitive market for KI tablets but sometimes the cheaper brands don’t have FDA approval because they’ve mixed the KI with other ingredients.